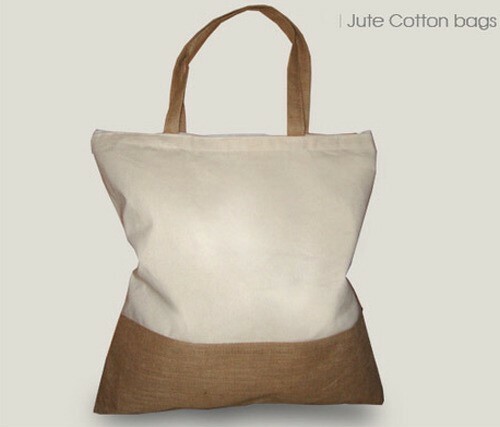 We offer a wide collection of Jute Cotton Bags are made of fine jute materials and cotton as per the latest trends and styles. These are available in different patterns, designs and color combinations thus making a wide variety to choose from. Known for their fine finishes and longer life, we offer these jute & cotton bags at most affordable prices. Indarsen Shamlal Pvt. Ltd. is established in 1996 who can provide you all types of customized as well as standard Jute products at a very competitive rates, whether it is for Garden and Nursery, Geotextile for construction, Hessian (Burlap) for packaging, Bags for Food packaging, Webbing and Tapes, Jute Matting, Yarn, Twine and Rope or diversified products like Jute and Cotton Promotional bags, dyed and printing fabric both laminated and unlaminated, besides eco-friendly, fire retarded and water replanted fabrics for various industrial and domestic uses. We do customize packing for ready to sale on stores with printed labels, barcode etc.